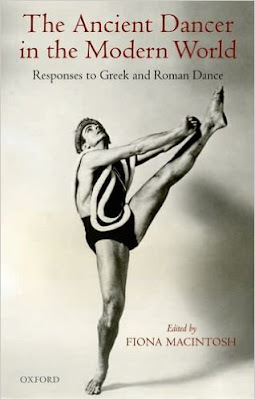 Fiona MacKintosh, edited by, The Ancient Dancerin the Modern World – Responses to Greek and Roman Dance, Oxford, Oxford University Press, 2010. Greek and Roman cultures represented a constant reference point in the history of dance. Jean-Georges Noverre drew inspiration from “ancient pantomime” in the development of his ballet d’action. Noverre was often inspired by Greek tragedies for the theme of his work, like Medée et Jason (1763) and Alceste (1767). As is known, Isadora Duncan elaborated Greek culture in her vision, included her famous loose tunics and bare feet. Editor Fiona MacKintosh has highlighted that, “this dependence on ancestry also occurs because ‘looking back’ is a sure way of acknowledging both debt and position within a tradition”. The Ancient Dancer in the Modern World – Responses to Greek and Roman Dance, is the first meticulous attempt to investigate the fertile relationship between dance in general and Greek and Roman dance with a focus on numerous aspects. The volume is organized into five parts, each of which unveils a valuable perspective: Dance and the Ancient Sources, Dance and Decadence, Dance and Myth, Ancient Dance and the Modern Mind, and the Ancient Chorus in Contemporary Performance. The first part is crucial because of its critical understanding of sources, the first step to map out this relantionship. Ann Cooper Albright, in her essay, “The Tanagra Effect: Wrapping the Modern Body in the Folds of Ancient Greece”, delineates the interest in ancient Greece of four performers, Duncan herself, Loïe Fuller, Eva Palmer and Colette. The expression ‘Tanagra Effect’ refers to the Tanagra sculptures, also known as the Tanagra figurines (so called for the place where many of them were found) of ancient Greece, “whose draping clothes and folded scarves brilliantly capture the underlying movement of their bodies”. It symbolizes a dress style typical of the modern woman, one whose lifestyle literally incorporated choices (…) with a mobility unheard of twenty years earlier”. Duncan, Fuller, Palmer and Colette all engaged with this kind of choices in their own approach to performance. The last chapter of this part, “A Pylades for the twentieth century: Fred Astaire and the aesthetic of bodily eloquence” by Kathleen Riley, is quite fascinating with regards to the North American tap dancer, but perhaps a bit overstated in drawing a comparison between his style and that of “the art of ancient pantomime”. Pylades was a renown virtuoso, but Astaire does not convincingly look as his “twentieth-century heir”. The third part deals with the meat of the matter, i.e. myth. Barbara Ravelhofer’s study, “Ancient Greece, Dance, and the English Masque” reflects on the sixteenth and seventeenth century English “distinctive kind of dramatic entertainment” which “involved music, dancing, fanciful costumes and settings”. The masques by Thomas Campion were an “intriguing example of how classical antiquity materialized onstage”. The role of masque designers is also taken into account, with the example of Inigo Jones who attempted a kind of historical accuracy in his work. Heniretta Bannerman’s “Ancient Myths and Modern Moves: The Greek-Inspired Dance Theatre of Martha Graham”, offers an insightful analysis of Graham’s long lasting interest in Greek tragedies and myths. She also exemplifies Graham's “principles that underpins these works”, such as Jungian psychoanalysis and the archetype concept, the dramatic element set to stage her heroine’s inner struggle, as it happens with her 1947 reworking of the Theseus and the Minotaur myth, Errand into the Maze. She then focuses on the cycle motif “of death and renewal” present in works such as Cave of the Heart (1946), where Graham powerfully retells the Medea myth. According to Bannerman, “Graham understood the relationship between Greek myth and the innermost reaches of the mind and heart” and “grasped the principles that underpin Greek tragic theatre”. The chapter closes with a notable investigation of Graham’s influence on Frederick Ashton’s Persephone, starring Svetlana Beriosova. Part four is probably the most appealing in that it examines the connection between ancient dance and the modern mind. Daniel Albright’s essay, “Knowing the Dancer, Knowing the Dance: The Dancer as Décor” is quite thought-provoking: “A dance is a kind of art in which the performer’s physical presence constitutes the surround in which the dance takes place – as Yeats put it, ‘How can we know the dancer from the dance?’” Dance and décor often intermingle echoing, for instance, the practice of classically inspired statue posing as devised by Emma Hamilton at the end of the eighteenth century. This is connected with dance and places too, dance and architecture and Rudolf Laban’s theories, “we became space through stillness”, Carol Brown wrote. Laban’s notion of kinesphere, the dancer’s “personal envelope of space”, perfectly illustrates this aspect. Various other examples are presented, like Oskar Schlemmer’s Tradic Ballet (1922) or Loïe Fuller’s groundbreaking metres-long costumes, where the dance-décor connection reaches its climax, as “a dancer (…) constitutes a place”.